What is Network Availability Prediction? The Network Availability Prediction program enables users to predict the availability and reliability of communication networks. 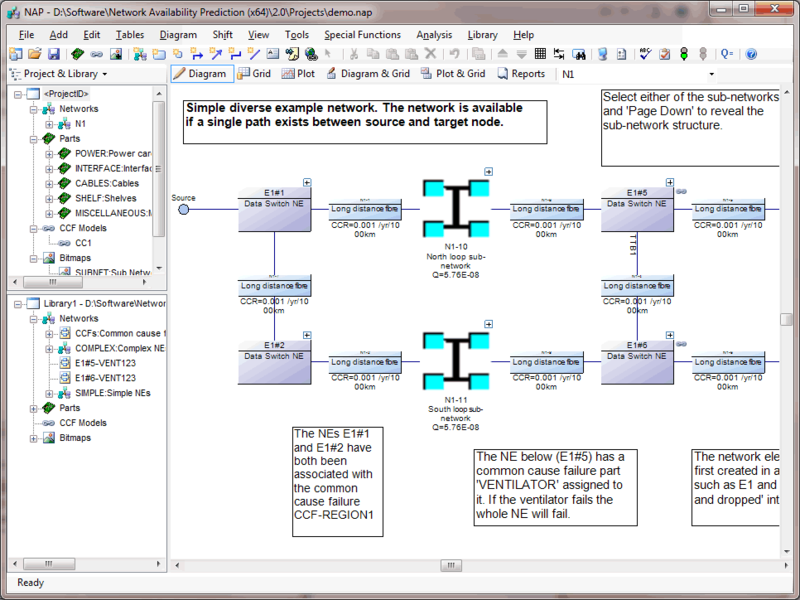 The Network Availability Prediction network block diagram model utilizes an extended Reliability Block Diagram (RBD) methodology that addresses the specific characteristics of network elements and their connections. In addition to predicting network availability, Network Availability Prediction also provides criticality rankings that identify weak spots in the network. What’s Included in Network Availability Prediction? Network Availability Prediction provides many time-saving features to allow users to quickly construct the network diagram. These include a parts library facility that allows users to import their parts data in convenient groupings, a network element library facility that allows users to construct common network element diagrams and a fully interactive network diagram construction facility. One of the important features of Network Availability Prediction is that it allows the modeling of data flow in different directions along the same network path. This means that users need not be specific about the direction of data flow in selected parts of the network. Network Availability Prediction will then automatically determine the allowable paths between a source and target, and hence determine the minimal cut sets that determine the availability of the network. Complex or simple networks may be modeled using Network Availability Prediction. Network elements may be logically modeled right down to part level using the powerful Network Availability Prediction pagination facility. Individual network element diagrams have been extended beyond traditional RBDs to allow users to model multiple interfaces and their interactions with common equipment. Users may also restrict the analysis to network paths traversing a limited number of network elements (limiting the ‘hop’ number). This useful feature eliminates unrealistic ‘snake-like’ paths in complex networks.